It is important that parents, families, physicians, educators, and other community members understand and explicitly tell children and teens that the healthiest choice is to not use any drugs, including alcohol, nicotine (tobacco) and marijuana. When youth are using substances, it is important to intervene as early as possible. Parents and caregivers are often in the best position to intervene. An important part of intervention is getting an evaluation from a medical professional, to determine if treatment is needed. Pediatricians also have the opportunity to identify substance use and intervene by regularly screening their patients using clinical tools like screening, brief intervention and referral to treatment (SBIRT) and explicitly encourage their patients to refrain from the use of alcohol, nicotine, marijuana and other drugs for their health. Finding treatment -- whether for your teen, a loved one or yourself -- for a substance use disorder can be overwhelming. Not all treatment programs have a stated goal of abstinence. Some consider reduced substance use to be a success. However, any amount of substance use is unhealthy, and any amount of substance use makes relapse more likely. Quality treatment for adolescents has a goal of long-term recovery which includes abstinence from all drug use. It is important to understand that treatment does not "fix" or "cure" the addicted person. Treatment is the first step in the long process of achieving recovery. Many people who successfully complete treatment return to substance use or relapse. After treatment, and even during treatment, there are many events and challenges that may tempt a person to resume substance use. It is important that people with addictions have the support of friends and family after treatment as well. Read more about supporting long-term recovery below. The following resources may help you find and choose a treatment option. Family Resource Center - A directory of resources backed by various degrees of scientific support to those that come from the most notable, national sources. It is a place to start getting informed about how to prevent drug or alcohol use, intervene early, find treatment and support adolescents in addiction recovery. National Center on Addiction and Substance Abuse - A national non-profit research and policy organization focused on improving the understanding, prevention and treatment of substance use and addiction. Includes How to Find Quality Addiction Treatment. Partnership for Drug-Free Kids - This website provides information to parents on how to spot teen drug use and what to do when a teen is using drugs. The Partnership offers one on one support to parents as well resources for individuals that want to make a change in their community. Check out the Partnership's resource, What to Look for – and What to Avoid – when Searching for an Addiction Treatment Program. Seeking Drug Abuse Treatment: Know What to Ask - This guide published by the National Institute on Drug Abuse offers guidance in seeking drug abuse treatment and lists five questions to ask when searching for a treatment program. SAMHSA Treatment Finder - The Substance Abuse and Mental Health Services Administration (SAMHSA) of the US Department of Health and Human Services maintains an up-to-date nation-wide referral network. Chemical Slavery is available for purchase at Amazon.com. 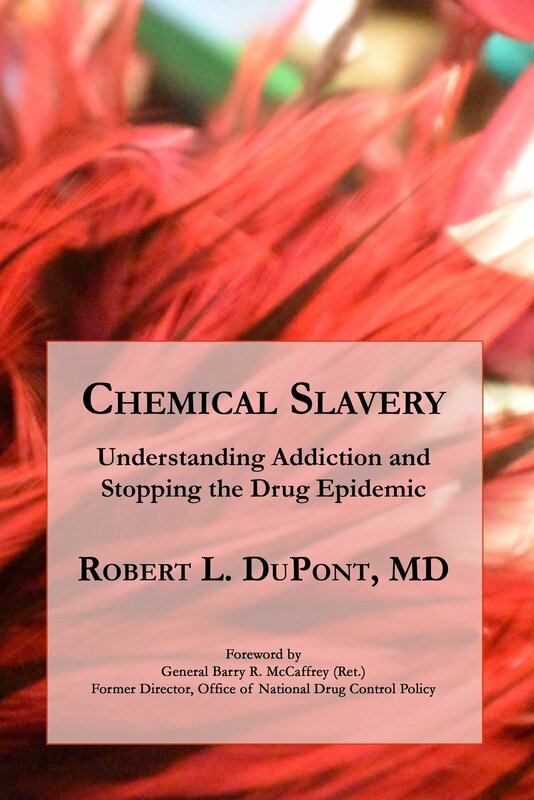 Chemical Slavery: Understanding Addiction and Stopping the Drug Epidemic by Robert L. DuPont, MD covers two crucial topics: First, the national drug epidemic including an understanding of its evolution to become a national emergency, and the science of addiction and recovery. Second, Dr. DuPont presents his experience-based guide to the intimate, day-to-day struggle with the disease of addiction from prevention to lasting recovery. This book shows the ways in which these two domains of addiction, the national and the personal, are intertwined and can be both understood and managed. Once individuals with substance use disorders decide they want to make a positive change in their lives and enter recovery, they begin a life-long journey. Recovery has been defined as a voluntarily maintained lifestyle composed characterized by sobriety, personal health, and citizenship. Recovery explicitly includes abstinence from all drugs and taking a drastically different approach to handling life’s challenges. Many people of all ages have begun speaking about their own experiences of recovery, including the difficulty of maintaining sobriety and the great joy of living a fulfilled life free from all drugs. This is just one of many stories that prove recovery is possible. James Mahowald, 22, shares his personal story and explains what recovery means to him, as someone who has been in recovery since the age of 19. There are many ways to support teens in recovery. Parents can help by keeping their homes substance-free and rewarding and encouraging teens’ good behavior. Attending teen-focused 12-step meetings of Alcoholics Anonymous and Narcotics Anonymous are another great way for young people to find support by others in similar situations. Some areas offer recovery high school programs and sober living spaces at colleges where everyone in that space is dedicated to maintaining sobriety. More about recovery high schools can be found at the Association of Recovery Schools. In October 2017 PBS Newshour aired a segment on Hope Academy, a recovery high school in Indianapolis. In December 2017 The Denver Post featured the work of school-based health programs in Denver which provide substance use disorder treatment during school hours. Young People in Recovery (YPR) is a national advocacy organization that through city and state chapters aims to influence public policy to make it easier for youth to find and maintain their recovery from addiction. More information on support for teens in recovery are below. Alcoholics Anonymous - AA is a 12-step support group for recovering alcoholics. This site provides guides for running an AA group as well as information on how to find an AA group. Association of Recovery Schools - This organization provides information on high schools focused on supporting students in recovery. There is a list of recovery high schools across the country. The Collegiate Recovery Movement - This research report from the Hazelden Betty Ford Institute explains the difficulties college students in recovery face and describes the benefits of College Recovery Programs (CRPs). Continuing Care Guide - This guide from the Partnership for Drug-Free Kids and the Treatment Research Institute (TRI) provides information on how people in recovery can maintain sobriety including 12 step meetings, appointments with addiction specialists, family involvement among other things. Faces & Voices of Recovery - A national non-profit organization committed to organizing and mobilizing the millions of Americans in long-term recovery from addiction to alcohol and other drugs, our families, friends, and allies to speak with one voice. Narcotics Anonymous - NA is a 12-step support group for people in recovery from any drug addiction. This site provides information about meetings across the country as well as resource for meeting facilitators. Oxford House International - Oxford Houses are democratically run, self-supporting and drug free home. Oxford House Inc. connects all Oxford Houses and provides information and resources for those interested in creating their own Oxford House. Recovery Resource Institute - A leading non-profit research institute of Massachusetts General Hospital and Harvard Medical School, dedicated to the advancement of addiction treatment & recovery. Thoughts on Recovery from Patients - Videos of individuals report the most important things they have learned through addiction and recovery.